BITSAT 2018 (बिरला इंस्टीट्यूट ऑफ टेक्नोलॉजी और साइंस एडमिशन टेस्ट): The Birla Institute of Technology and Sciences Admissions Test is an exam which is conducted by BITS Pilani for the admissions in various courses. The admissions are provided to Bits Pilani and to its all other campuses. The interested students can apply for the BITSAT Application Form 2018. The dates and official notification for the form are not announced yet. 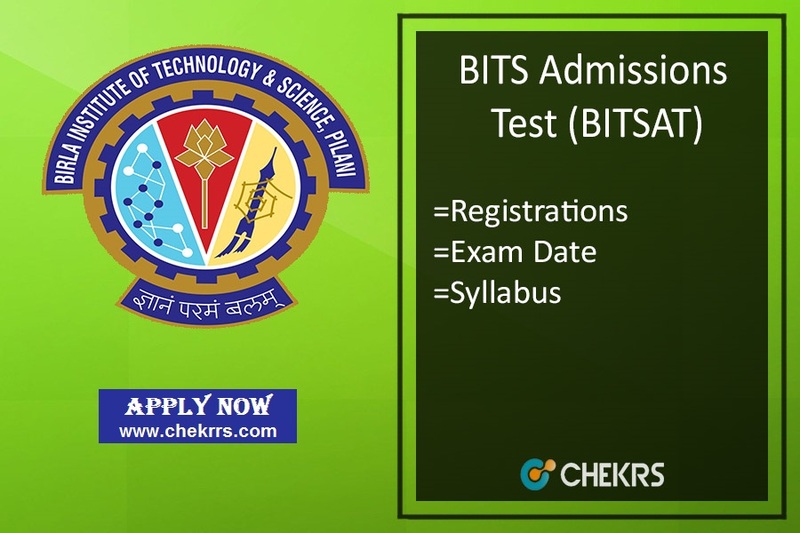 The students who will qualify the entrance exam will be eligible for the BITSAT Admission 2018. The aspirants will be provided to engineering, pharmacy & many other courses of the University. The students have to submit the BITSAT Application Form 2018 before the due dates. The aspirants who will submit them on time, only they will be considered for the admissions. We will provide here the direct link for the submission of the BITSAT Online Application Form. The aspirants can access the official website or the link we have mentioned here for the successful submission. According to previous year dates, the application form will release in January and the last date will be in March. The exam will be conducted in May. Steps for the submission of the BITSAT Form 2018. Then they have to click on the link regarding the application form present on the homepage. Now enter your all valid details carefully and correctly. Now attach the scanned copy of required documents, Photograph and signature along with the application form. The aspirants can pay the application fee via any of the online banking options. Submit the application form by clicking on the submit button. Also, take a print of the generated form for future purposes. Payment will be done through ICICI Bank Credit Card, Net Banking, Debit Card etc. The aspirant should have passed the 12th Standard with PCM/ PCB from any recognized board. The aspirants passed 12th in 2017 can also apply for the admissions. For B.Pharma Admissions biology in 12th is compulsory along with proficiency in English. They must have scored minimum 75% marks in PCM/ PCB Subjects. The aspirants have to check the BITSAT Syllabus Pdf before starting their preparations. The syllabus is mentioned here topic wise.